The Kingswood Oxford varsity girls squash team picked up a pair of wins recently, including a Senior Day triumph over Greens Farms Academy. 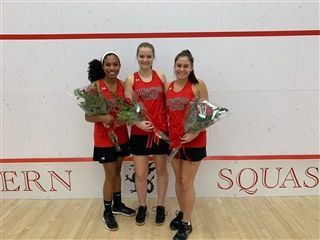 The Wyverns swept the Dragons, 7-0, to send seniors Ananya Alleyne ’19, Cami Berckemeyer '19 and Claudia Petrie ’19 out winners. Senior Co-captains Alleyne '19 and Cami Berckemeyer '19 each lost only five points total in their matches in the number two and three spots, respectively. Petrie '19 finished her last home match with a turnaround of a difficult first game, moving on to win three straight games and take the match. Izzy Berckemeyer '21, Amelia Levine '20, and Sloan Duvall '21 all took their matches in three games to clinch the team win. The Wyverns also picked up a 5-2 victory over Loomis Chaffee, avenging a tough 4-3 setback to the Pelicans at the WALKS Play Day to begin the season. “We hadn't played Loomis since our nail-biter 4-3 loss in the WALKS play day before the regular season started, so this match felt like a way for us to show how we've improved over the course of the season,” coach Biondi said. Alleyne '19 (#2), Cami Berckemeyer '19 (#3), Izzy Berckemeyer '21 (#4), Claudia Petrie '19 (#5) and Sloan Duvall '21 (#7) earned wins for the Wyverns against Loomis. KO also won #8 with Ely Alleyne '23, which isn't recorded in the team score but was a good 3-2 win. After winning the Division V title at Nationals, Kingswood Oxford played some tough opponents and will go into New Englands this weekend battle tested.